Gerald Lister Lindsell Dodson was born in Caythorpe on 19th September 1921. His father, Charles Sherborne Dodson was a doctor who’d served at Salonika during World War One before moving to Caythorpe about 1919. Charles and his wife Irene Frances lived at Corner House (now Caythorpe Residential Home). He remained the doctor in Caythorpe until retiring in 1946, though he continued to serve as president of the Caythorpe District of the British Legion. The following year they moved to the Three Gables in Leadenham. Dr Dodson died in 1957. Gerald Dodson attended Stowe School before joining Trinity College Cambridge on 1 Oct 1939. He was commissioned in the Gloucestershire Regiment (probably 1941). 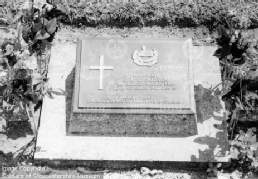 In 1944 he was a Lieutenant in 10th Battalion, Gloucestershire Regiment, which was operating as an infantry unit in Burma. 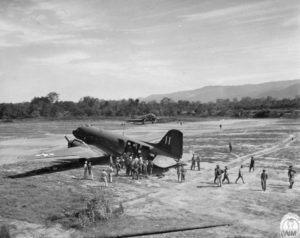 After fighting on the Arakan, in July 1944 they were flown to Myitkyina to join General Stilwell’s combined British, American and Chinese force, building a new Burma Road from India to China. 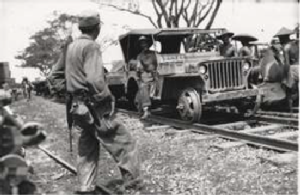 They marched through difficult country, being supplied by airdrop and by jeep railway line, losing more men to sickness than combat. During November 1944 they came up against the veteran Japanese 18th Imperial Division at Pinwe. On the morning of 22nd November they assaulted enemy positions which had been softened up by artillery and air attack. Progress was slow, through difficult bamboo country. The Japanese launched several counter-attacks, and for a time the Gloucesters were isolated. ‘A’ Company cleared an enemy bunker position, then ran into more heavy machine gun and mortar fire. They beat off an enemy attack but all the company’s officers were killed. ‘B’ Company, who were following up, fought off an attack as the enemy moved in behind them. They dug in, but suffered many casualties (including 3 officers) from snipers in the ivy-covered trees. It’s likely that Lt Dodson was killed in the A or B company actions that day. He was buried at Pinwe. 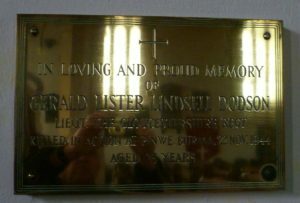 A brass plaque inside Caythorpe church reads: In loving and proud memory of Gerald Lister Lindsell DODSON. Lieutenant, The Gloucestershire Regiment. Killed in action at Pinwe, Burma. 22nd November 1944, aged 23 years.